Gamestar Mechanic offers you a number of methods for sharing stand-alone versions of your games. You can see your options in the sidebar on the right side of the game’s page. By using the buttons there, you can easily set up links outside of Gamestar Mechanic that point to your game and allow viewers to click and play it. Recommend: Suggest this game to another player. Email: Share your game with someone by sending a link via e-mail. Link: Generate a link to your game and then share the URL with other users. Embed: Create code that inserts the game window directly into another website — this requires the uploader to have access to HTML code. Social media: You may see one or more small buttons after the ones just described, marked with symbols representing various forms of social media (such as Facebook and Twitter). The one you see here is for Edmodo, but your selection can change based on the social media accounts that are linked to your Gamestar Mechanic account. If you want to send your game only to certain friends, Gamestar Mechanic lets you do it. If you share a game via e-mail in Gamestar Mechanic, the message contains the title and author of the game as well as a link for the reader to play it. The Share Game via Email page appears. You can enter as many as five e-mail addresses, separated by commas. You can also enter your own e-mail address, if you want, so that you can confirm that the game reached your recipients. 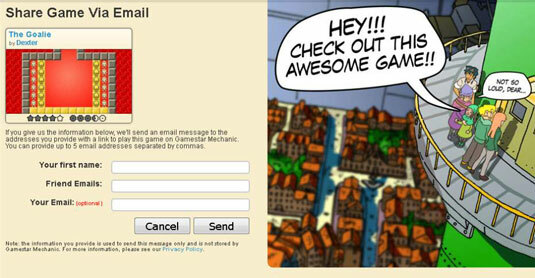 Or click the Cancel button to return to the player page of your game without sending any e-mail messages. If you click the Link button, you can generate a static link to your game. Anyone with an Internet connection (even non–Gamestar Mechanic users) can use this link to play the game. 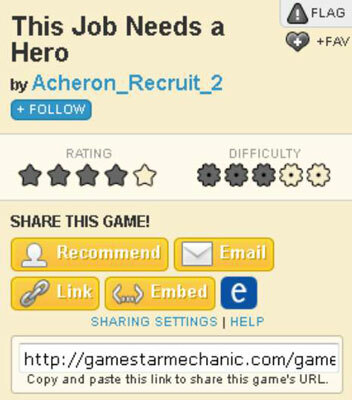 Gamestar Mechanic generates a custom URL for your game in a text box below the Share buttons. Copy the link from the text box. Share the link with others. If you want to take an approach to sharing your game that makes your link more immediately interesting, you can create windows outside of Gamestar Mechanic to allow players to try your game from anywhere. Following this strategy means that your game isn’t represented only by text, but rather by an interactive screen that brings the Gamestar Mechanic experience directly to players. To use the embedding system, you must have editor access to a website that allows HTML tags. It’s usually a blog or website of your own or an HTML-enabled forum. If you aren’t sure whether HTML is allowed, you can always try it out; embedding a game requires just a little copying and pasting — no experience with HTML code is needed. When you embed a game, it appears on the website or forum as a large game screen with a blue arrow button in the center. Anyone who clicks the blue arrow, whether or not that person is a Gamestar Mechanic user, can start playing the game on that screen. 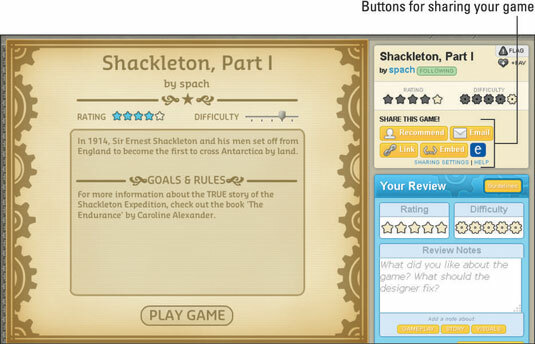 This sharing method allows people to play games without linking to a new website, which many people are hesitant to do. 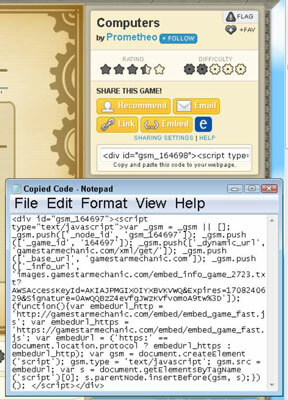 Gamestar Mechanic generates the HTML code necessary to embed the game into your website or forum. Copy the HTML from the text box. Paste the text into your website, blog post, or forum. Your game appears wherever you embed the HTML. 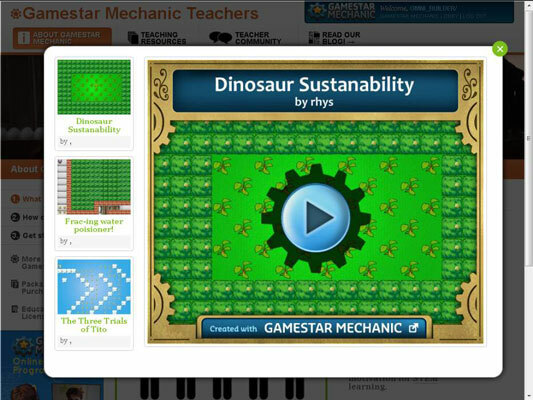 Some popular websites are directly supported by Gamestar Mechanic, which means that you can link to them directly from the corresponding share buttons. The websites that are supported depend on the accounts you have linked to your Gamestar Mechanic account. By clicking the corresponding button, you are taken to Facebook, Twitter, Edmodo, or another social media site, where a link to the game is set up for you to post.